The people who made heavy metal fantasy adventure Brutal Legend and Halloween role-playing game Costume Quest have revealed their next game, Stacking, a simply named game with many layers. And Russian nesting dolls that emit vicious gas in gameplay. Double Fine Productions and THQ have unveiled the second of two games they'll be releasing together, the downloadable puzzle-adventure Stacking. According to details provided to IGN, players will assume the role of tiny Russian stacking doll and chimney sweep Charlie Blackmore who can insert himself into other, larger dolls to assume their abilities. As shown in the game's debut trailer, Charlie can slip inside dolls that can float, unlock doors, seduce guards, belch, fart and scream, all tactics needed to overcome Stacking's puzzles. Players will embark on a quest to reunite Charlie "with his family after they've been forced into indentured servitude by an evil industrialist." Stacking was created by Brutal Legend art director Lee Petty of Double Fine. 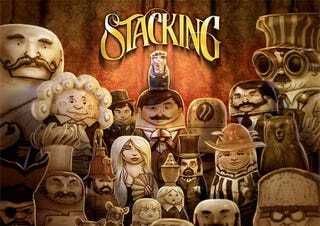 Stacking is due to hit the PlayStation Network and Xbox Live Arcade during spring of next year.